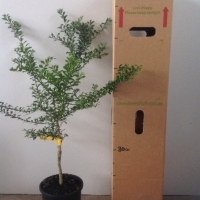 Daleys Fruit Tree has Plants for Sale to Nowra Dc and can Mail Order them to you door. Click to Find out how much Freight Will Cost. 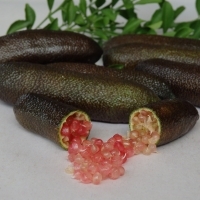 The yellow finger lime has a beautiful bright yellow skin and very large juice vesicles inside. The balls of juice bubble out of the skin when the ripe fruits are cut in half. Use in chutneys, jams, marmalades, savoury sauces and refreshing drinks. Bright pinkish-red vesicles are held inside a dark brown to maroon coloured skin. Good flavour and a high yielding variety.